First, Dan Snyder sold Redskins fans the old peanuts he got from a bankrupt airline, as Dave McKenna mentions in "The Cranky Redskins Fan's Guide to Dan Snyder." (You have just experienced "We Are All Dave McKenna CCX.") 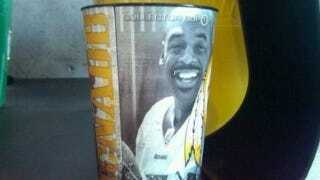 Now Snyder is charging fans at FedExField $6 for Donovan McNabb soda cups. Oh, wait. I'm not supposed to say that because, you know, it's not Snyder himself manning the cash registers. It's just the people who work for him.